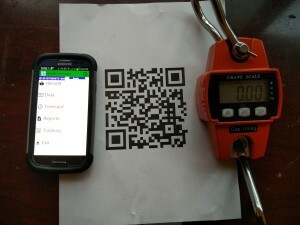 Collect all of your data on a normal android smart phone or tablet. Use all new features available in the smart phones and tablets to capture information, scan, take pictures, send message, view web reports, use maps, tag location all using the same device. View Web Reports from anywhere at any time. Connecting to devices using standard Bluetooth interface such as field sensors or weighing scales. Low upfront costs, no software to purchase, no expensive proprietary hand-held devices, use existing or low cost smartphones or tablets, one time set up cost. Time saver, field managers spend less time filling out time sheets, equipment and material usage reports, spend more time managing. Information is entered one time, reducing errors from copying data from paper reports. Maintain inventory as it used, view what is on hand at any time from any device with internet connection. View your employee costs, equipment costs, material usage and costs, income, inventory in total or drilled down to a single location through the web portal. Evaluate inspection reports to plan work that needs to be done using Google Maps. Schedule work for each of your teams. Maintain a schedule for equipment maintenance. Arrange data to provide the necessary reports needed to comply with Global G.A.P., Fair Trade, Organic or other certification requirements.